The 1987 Ryder Cup Matches at Muirfield Village produced one monumental residual benefit - another out-standing Memorial Tournament champion. Curtis Strange, arguably America's premier player in 1985-87-88, had finished 31st, 39th and 35th in the last three Memorials. As late as 10 days before '88 tee-off time, his name remained in the Memorial's "uncommitted" file. "You have to skip somewhere," Strange said, after the lowest closing round by a champion (67) had given him a two-stroke victory over a resurgent Hale Irwin and persistent David Frost (274-276). "When you look at your schedule, in all honesty, you see where you've played well and where you're comfortable and that didn't include the Memorial at one time." His plan to skip Jack Nicklaus' annual tee party changed for two reasons: 1) he was forced to withdraw from the Colonial the previous week because of a back spasm: and 2) he had come to know a more likeable Muirfield during the Ryder Cup, a Muirfield that appeared likely to reoccur for the Memorial. "It played so much different (last September) than I'd seen it play in the past," he explained. "I'd never seen it play hard and firm and the greens get real hard and firm. That suits my game. When it gets firm, I get much more comfortable with it." Muirfield was firm and fast for the '88 Memorial, in contrast with the previous two years. "It was identical to the Ryder Cup conditions," Strange recalled. "Playing in the Ryder Cup helped tremendously to learn and get used to the (fast, firm) course. "I can drive in these fairways and now the game starts. You just don't grab a 6-iron and bust it up on the green somewhere, you've go to think about what type of shot you're going to hit, where you're going to hit it and where you might leave the ball. The second shot is where the game starts and that's right down my alley." Strange said "the dominant players have something that stands out...length, tremendous putters . . . ," but over modestly insisted "if you look at my game - and I've read this too many times - I don't have anything that stands out. Ask what's the strong part of my game and I answer that there are no weaknesses. "I don't hit the ball 300 years down the fairway, I don't hit 2- irons over the clouds and land up on the green soft, so I have to do what I do best: consistency, patience, driving it straight, reaching down in my gut and getting something extra down the stretch. Whatever I can do to gain some advantage, I have to do." The 33-year-old had it at "gutcheck" time Sunday, after rocketing into contention with a course-record-tying 64 (8-under) in the third round. He kept command in a strong three-man battle and noted a satisfaction afterward "when that heat is on, you find out what you're all about." He built a 3-stroke lead at 12-under with birdies on Nos. 4 (35-foot putt), 5 and 7 in the fourth round, but tough competitor Irwin, who had led at 36 and 54 holes, fought back to tie Strange at 11-under after 11 holes and Frost actually grabbed the lead at 12-under with birdies at Nos. 9, 10, and 11. But Strange fired three birdies in the last seven holes, forging a two-stroke lead with two holes to play. Irwin's chip-in from the rough at No. 18 only gave him a share of second. Strange's 67 was the best by a champion in 13 Memorials; his 64-67-131 ties Scott Hoch's 1987 tournament record for consecutive 18 holes; and his 274 came within three of Hal Sutton's tournament make of 17 under 271 set in 1986. "Seventeen under is awfully good," Nicklaus conceded, "but under these conditions, 14-under is an unbelievable score. I'd say the golf course played 6-7 shots tougher (than in 1986)." "I'd say the 14-under is better than 17-under, absolutely," Irwin declared. "The course played much harder (than 1986)." Irwin also suggested that Strange "has got to be the best player in the world right now," an estimate that gained greater credence two weeks later when Strange added the U.S. Open to his record of 10 victories in four years. "To play the way I played the last two days on this (Muirfield) golf course, which is a very, very demanding course, and to win against as good a field as you can probably get is very, very rewarding," decided the Memorial's 13th champion. "When the heat is on, you find out what you're all about. It's fantastic." On the first of four hot, sunny days, the 102 starters averaged 73.96 strokes, a dramatic indication of Muirfield's more normal (than '86 and '87) challenge. The field averaged 72.299 in '87. Only 20 broke par, compared to 49 in '87. Peter Jacobsen and John Mahaffey split the lead with 68's, one better than Frost, Jim Hallet, Rocco Mediate, Aki Ohmachi and John Huston. Lanny Wadkins' 69 in 1979 is the highest to lead a first round. Strange was in the pack at 73. When host Nicklaus missed the 149 cut, Irwin became the only player to qualify in all 13 Memorials. 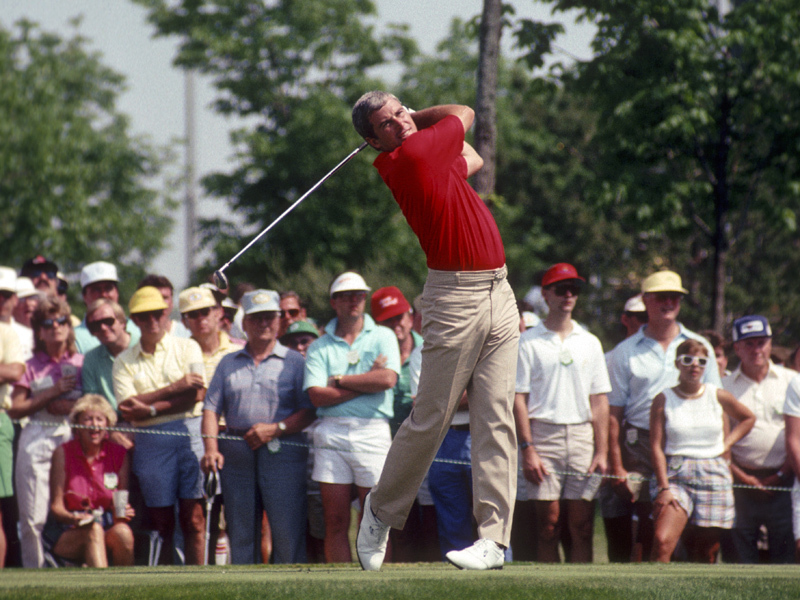 The 1983 champion also became the 36-hole leader with 70-68-138, with Frost, Huston and Tom Kite a stroke back. Strange added a 70 for 143. Despite an intestinal upset, Irwin managed a second straight 68 for 206 to stay apace Strange - whose 64 included nine birdies - and Frost in the third round. Payne Stewart, with a 67, and Andy Magee shared third at 208. Hoch tied the course record (64) for the second straight year for a 211. Irwin bogeyed two of the first four holes on Sunday, but rebounded for a 70 that further boosted his morale. After being winless since the '85 Memorial and missing six of 11 cuts in '88 - due to devoting more time to golf course design business than golf, Irwin left Muirfield with "a real positive (feeling) that I can still play." Frost's 69 - 276 meant his eighth Top 10 finish in '88 and second runner-up check in a month. Bobby Wadkins' 31-35 - 66 was the best closing round, but only for a 287. Jay Haas tied Nicklaus' record of six birdies in a row on No. 4 though No 9 in the final round in a 68 that tied Hoch, Jacobsen, Stewart, Lanny Wadkins and Greg Norman for sixth at 293. Defending Champion Don Pooley, recovering from pneumonia, slipped to a 296 (272 in '87). Notable near-misses: Jim Hallet's tee shot hung on the lip at No. 16 in the first round. No. 16 is the only par-3 that has not been aced... Norman's 329-yard 3-wood second shot on No. 15 in the third round lipped out. It would have been in Memorial's first double-eagle.